With 89 percent of votes counted, the Palang Pracharat party was first with 7 million votes. Pheu Thai, which was the governing party ousted by the coup, was next with 6.6 million votes. A new party, Future Forward, which became popular with young voters, had scooped up nearly 4.8 million votes. Voters deserted the Democrat Party, Thailand’s oldest political party, and its leader resigned. Thais voted for a 500-member parliament, which along with a 250-member junta-appointed Senate will decide the next prime minister. The election was the latest chapter in a nearly two-decade struggle between conservative forces including the military and the political machine of Thaksin Shinawatra, a tycoon who upended tradition-bound Thailand’s politics with a populist political revolution. 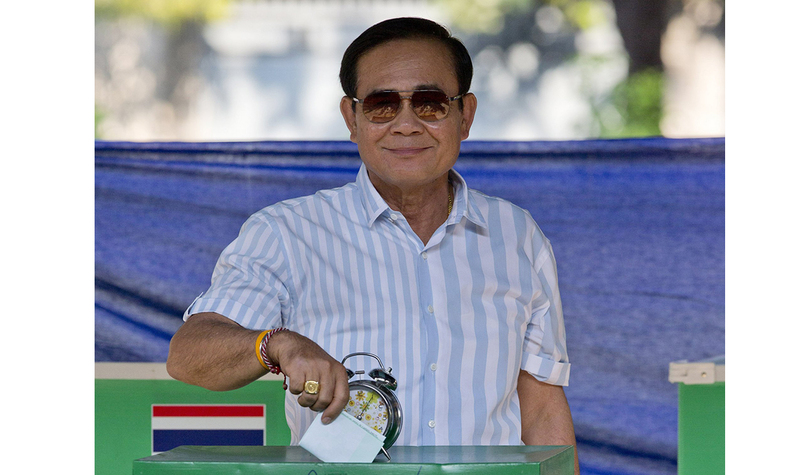 Prayuth, the blunt-speaking army chief who led the 2014 coup, was hoping to extend his hold on power after engineering a new political system that aims to stifle the influence of big political parties not aligned with the military. About 51 million Thais were eligible to vote. Leaders of political parties opposed to military rule urged a high turnout as the only way to derail Prayuth’s plans, but many voters stayed at home. Thailand’s powerful King Maha Vajiralongkorn issued a statement on the eve of the election that said the role of leaders is to stop “bad people” from gaining power and causing chaos. It was also broadcast on Thai television stations minutes before voting started. After the coup, political party gatherings were banned and pro-democracy activists and other dissenters were regularly arrested, interrogated and imprisoned. Just days before Sunday’s election, Pheu Thai said the houses of party officials and its campaign canvassers in some provinces had been searched by military personnel in an act of intimidation.